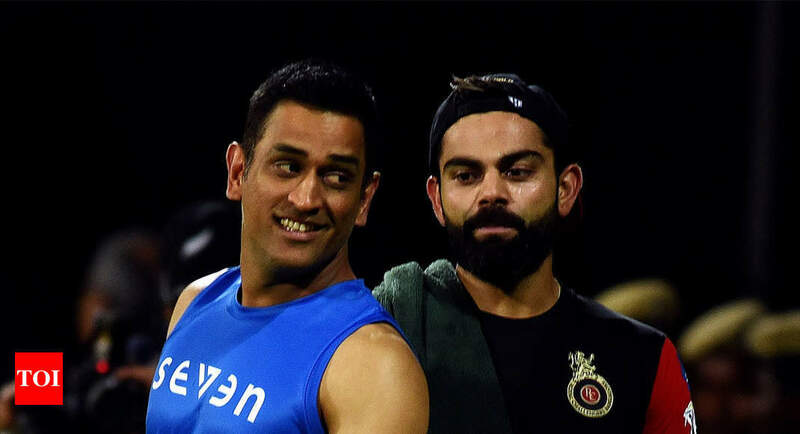 IPL 2019: Onus on MS Dhoni’s spinners to stop Virat Kohli & Co.
CHENNAI: On Wednesday evening, Chennai Super Kings (CSK) were dealt a big blow with pacer Lungi Ngidi being ruled out of the IPL. With Dwayne Bravo being the only foreign seam bowling option available until David Willey’s likely arrival after the second match, the onus will be on the CSK spinners to come to the fore and deliver right from the outset. The first game against Virat Kohli‘s Royal Challengers Bangalore will be quite a test for the bowling attack, which looks a little thin on paper. Unlike last season when the men in yellow were forced to play all but one of their home matches on a quicker surface in Pune, the spinners will be aided by the team’s return to the traditionally spin-friendly Chepauk. And they have all bases covered when it comes to variety in the spin department, with Ravindra Jadeja, Harbhajan Singh, Mitchell Santner, Imran Tahir and Karn Sharma being the options available. CSK coach Stephen Fleming is certainly enthused about the spin bowling resources at his disposal, picking out the return of NZ left-arm spinner Santner after missing the entire campaign last year as a valuable addition. “Mitch has got a good record in the subcontinent and it’s good to have him. We obviously missed him last year – so again it’s like a new signing,” Fleming had said here on Wednesday. “We backed our pace bowlers last year and they made the adjustment. This time, Imran Tahir is in good form. “Karn Sharma is also there and Harbhajan has loads of experience – we’ve got most bases covered and it’s just about getting the guys to perform and sitting on our game plan, especially at home,” Fleming added. The New Zealander may have forgotten to mention Jadeja, but he will be the keenest to make an impact. The left-arm spinner’s inclusion in India’s squad for the World Cup is still touch and go, and a few good performances in the tournament’s early stages might just help him make a strong case for selection. While Santner and Tahir are set to arrive on Friday along with Faf du Plessis, all the three Indian spinners bowled in the nets here on Thursday. Karn had the lengthiest stint, bowling his usual mixture of leg-breaks and googlies. Jadeja, meanwhile, took it relatively easy with the ball in his first session with the side before having a bat. Even as the two teams practised on either side of the main pitch to be used for the opener, there wasn’t extravagant turn on offer for the spinners. While Kohli took toll of the RCB spinners, the likes of Shane Watson, Ambati Rayudu and MS Dhoni did something similar against their CSK counterparts. Come Saturday, though, CSK will certainly expect the pitch to offer a bit more turn so that the spinners can make it difficult for the marauding RCB batting line-up.